After Konami hit upon a successful formula for basketball with Double Dribble, they went on to create a hockey game in a similar vein. The result was Blades of Steel, later released in Japan as Konamic Ice Hockey (コナミック アイスホッケー, Konamic Ice Hockey? ), an ice hockey game released by Konami for North American arcades in 1987, and ported to the Famicom Disk System and NES in 1988. All teams are fictional but based out of real Canadian and American cities. In comparison to Nintendo's own entry of the sport, Ice Hockey, Blades of Steel focuses more on a less-cartoony look and more realistic presentation. The game is known for its fast paced hockey action and for the inclusion of fights that break out between opposing players. 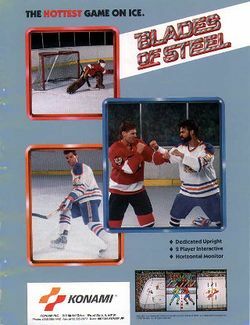 Blades of Steel differs from the professional game in the NHL in the late 1980s in that it has no offside rule, and its interpretation of penalties is somewhat unique. The game's officials only call two penalties. Players who lose a fistfight are penalized for two minutes, an abstract reworking of the five-minute offsetting majors normally assigned in the event of a fight. Should a fight break out in front of one team's net, then the player on offense gets a penalty shot. The penalty shot is administered in the style of a soccer penalty shot, in that the shooting player must stand on the blue line, instead of moving towards the goaltender. The game also recognizes icing infractions, with an appropriate game reset and faceoff in the liable team's zone. Blades of Steel has been well received by critics, regarded not only as a good hockey game for the NES, but also as one of the best hockey games ever created. The NES conversion remains faithful to the original arcade version, while also introducing some new concepts, including a mini-game based upon the boss battle in Gradius. The NES version was re-released on Nintendo's Virtual Console service on December 24, 2007. The arcade version was re-released on Microsoft's Game Room service on November 24, 2010. This page was last edited on 18 December 2013, at 02:29.